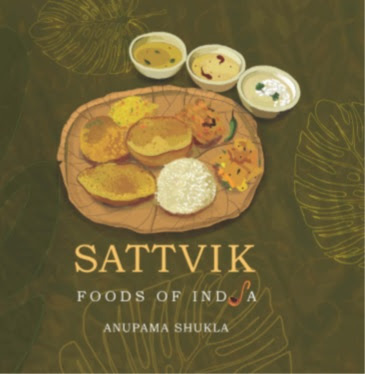 Sattvik Foods of India by Anupama Shukla is a cookbook with a difference. As the first word in the title of the book reads ‘sattvik’ – one can easily get it that it is a vegetarian cookbook. The book revolves round the idea ‘we are what we eat’. But, in today’s fast paced life we have forgotten the importance of food in our life – we just have food to fill our hungry bellies. We tend not to give much importance to the nourishment factor which eventually disturbs the natural balance in our body and pushes it towards illness. This book is not just a collection of recipes – it also dwells on the basics of why having the right kind food is essential for one’s physical and mental well being. The author very much believes in how Ayurveda explains the science of food. Before she begins dishing out delicious recipes, she briefly explains the Panchamahabhutas – the building blocks for every single thing in this world. She tells us about their relationship with the human body. We also get to know about the three ‘doshas’ that can affect a human body and ultimately how the ‘Prana’ in sattvik food can alleviates the negativity of the doshas. Every human being can have a different body constitution – so if we can understand our body type, we will be in a better position to choose the right balance in the food we consume. The best part is that the author has summed up the basics in just a few pages. So, my advice is before you jump to the recipe section of the book, do go through the first few pages – it will help you in appreciating the recipes better. The recipe section of the book is divided into certain segments. Right from breakfast, lunch, dinner, beverages, condiments and festive recipes are covered. If you were under the impression that sattvik food can be nourishing but not as delicious, this book is going to going to make you reconsider that thought. Some of my personal favorite recipes in the book include Aam ka Panha, Thandai, Chaas, Moong Anardana Salad, Paneer Pakora, Bhel Puri, Panchmel Dal, Bhara Paratha, Shrikhand, Rabdi and Til Patti. The book has over 70 recipes to please different tastes and palates. It showcases the fact that sattvik food can be tasty, colorful, nourishing and varied. The recipes are written in a simple and easy to follow language. There is an introduction to every recipe and notes where needed to assist the reader. Here I would like to add that it would have been useful to add the number of serving each recipe makes. The illustrator Suhita Mitra has done a great job with the numerous illustrations in the book. But, still I missed seeing pictures of the final dishes. A few pictures in between the pages could have made the book look more appealing and attractive – after all we all eat with our eyes first. Overall, it is a nice cookbook - one that doesn't just give out recipes but also educates us about the importance of eating the right kind of food for a healthy body and a sound mind. I received a free review copy of the book from the Leadstart Publishers in lieu of an honest review.